For everyone who begins a journey of ministry in the Catholic Church, the path to discernment is different because it is forged by individual experiences that brought each of them closer to God. What connects each of these men and women is the religious community they seek to become a part of, and the one they already belong to. As Manhattan College alumni, they’re members of the same Lasallian Catholic family, who gave them the space and support to deepen their faith, and the road map to follow in the footsteps of Saint John Baptist de La Salle, founder of the Brothers of the Christian Schools. 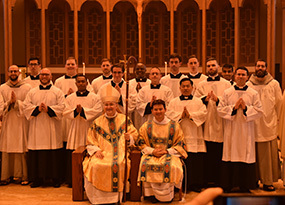 Past graduates who have since entered the Catholic clergy and the Christian Brothers might have their own stories to tell about their past, but when it comes to the future, they are unanimous: their plan is God’s plan, and they can’t wait to see it unfold. For Roman Kuzmiak ’17, family traditions have long overlapped with those of his religion – his parents were both raised Ukrainian Catholic, and continued the rituals of their faith after emigrating to the U.S. As a child, Kuzmiak became so connected to his home parish, St. Michael the Archangel Ukrainian Catholic Church, in Yonkers, that he began considering the prospect of one day becoming a priest. “I always had an attraction to the Church. I never encountered such a heart-saving and life-changing way of life than the one Jesus has shown us by his example,” Kuzmiak says. But his decision to join the priesthood was not immediate – in high school, he grew interested in math and science, which led him to Manhattan College. He now concedes that waiting to enter the seminary until after college was beneficial because it helped him to develop a broader knowledge base. 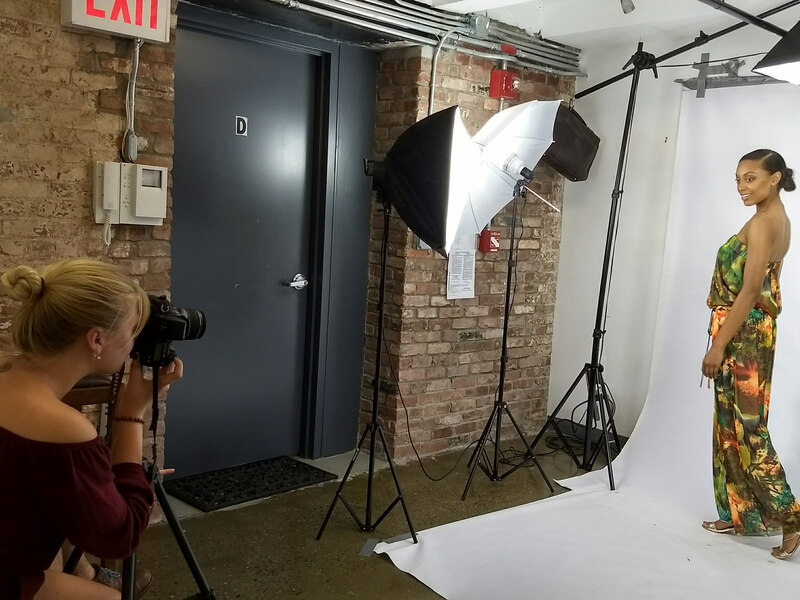 At Manhattan College, Kuzmiak studied electrical engineering, and was a member of the engineering honor society, Tau Beta Pi, which required him to tutor students in the program who were struggling. As an upperclassman, he was recognized for academic and leadership achievements as just one of 20 students to receive a James Patterson ‘69 Scholarship during his junior and senior years. He also enjoyed many valuable cocurricular opportunities, including an internship with the Consolidated Edison Company. But the pull Kuzmiak felt toward the priesthood never strayed too far from his thoughts. As graduation neared for Kuzmiak, he began thinking harder about his future. During the spring of his senior year, he applied to the St. Basil Seminary in Stamford, Conn., where he began studying to eventually become a Ukrainian Catholic priest. In September, Kuzmiak began a pre-theology program at the seminary that will last for two years, after which he will spend four years studying theology, and then eventually seek ordination. Now in his first semester, Kuzmiak is currently enrolled in philosophy courses that have begun to expand his perception of the unknown. “We see the irreplaceable value that human beings provide to this life every day, yet we understand its fragility. We work, pray, listen, and dedicate time to explore this mystery, and this grace that God has instilled in each of us,” he says. 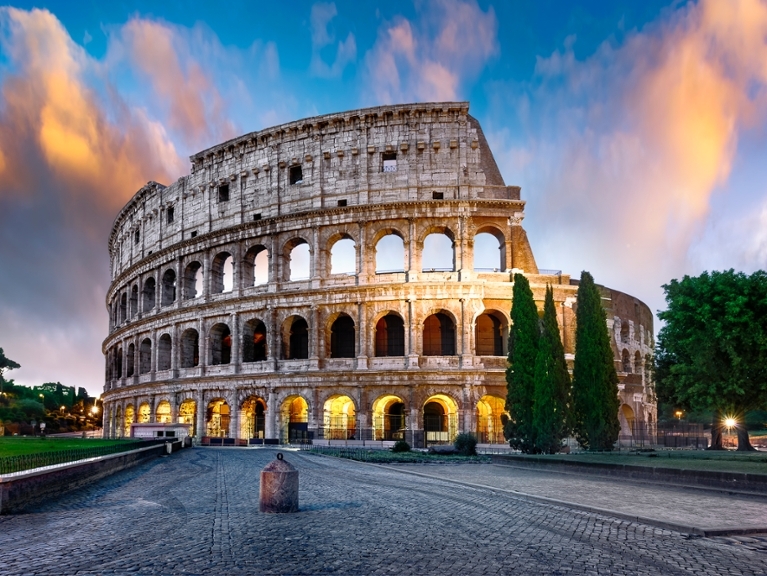 Through the program, Kuzmiak will become more familiarized with traditions of the Ukrainian Catholic Church (also known as the Ukrainian Greek Catholic Church), which are similar to those of the Roman Catholic Church, barring a few differences. Ukrainian Catholics (of the Byzantine rite) practice faith with the Divine Liturgies of Saint John Chrysostom and St. Basil the Great, as opposed to the Roman Catholic Liturgy. Being raised in the Byzantine rite, Kuzmiak remembers falling in love with the liturgy and the music, but still enjoyed the Eucharistic Celebration in the Eastern and Roman traditions. He recommends that all Catholics experience both because the range shows the universality of the Catholic Church, but, moreover, that they find their own journeys on which to embark. “We are each given gifts and talents; it is our duty to explore them and to use them to help those around us. God has a plan for each of us; we just have to trust in it,” said Kuzmiak. 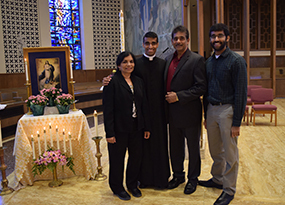 Savio Paul ’15 first realized his vocation to join the priesthood as a teenager, on a service immersion trip to Peru. He was a junior at Iona Preparatory School in New Rochelle, N.Y., and saw firsthand the level of trust the country’s people had in God, even in a state of economic disrepair, and without the latest iPhone or other advanced technologies to which those in the U.S. are accustomed. In the absence of these luxuries, the people he met in Peru were still some of the happiest he’d ever met. “I want what these people have,” Paul said to himself at the time. After that, he began mapping out his career trajectory: he would emulate the priests he grew to admire at the Church of Saint Anthony in Yonkers, and join the Capuchin Franciscans because of their reputation for great missionary work. But that decision changed after spending four years at Manhattan College, where Paul studied chemical engineering. Although it might seem an unlikely path for someone planning to pursue a career in religion, the complex concepts he learned in the classroom and laboratory taught him the skills necessary to thrive under pressure. “Engineering teaches you to think logically and reasonably. It was an intense curriculum, which, if anything, provided the foundation that helped me learn hard work and develop discipline,” he says. At Manhattan, Paul also competed on the Jaspers track and field team as a pole vaulter, for which he was named numerous times to the MAAC All-Academic team. Throughout his four years, he also connected more deeply with his faith by attending Mass regularly at the Chapel of De La Salle and His Brothers, where he got know the late Rev. George Hill, former chaplain at the College who died in September of 2016. In Fr. Hill, Paul found a role model. “I hope I can fill half of his shoes, and one day be half the man he was,” Paul says. Shortly after leaving the College, Paul began following in his footsteps. Last spring, he graduated from Cathedral Seminary in Queens, and in September began his first semester studying theology at St. Joseph’s Seminary in Yonkers, where he is enrolled in a four-year program that will culminate in his ordination as a Catholic priest. He is scheduled to graduate in May 2021. Of all the rewards that come with being a priest, Paul is most excited to lead Mass and confession, and help his parishioners receive the sacraments. Most of all though, he’s most looking forward to the joys he doesn’t yet know. “I’ve always loved service and helping people, and this is one of the greatest ways you can help. I’m looking forward to what God has in store for me next,” he said. Brother Paul Avvento ’07 was drawn to the Lasallian mission for education long before entering the Brothers of the Christian Schools Novitiate for the Lasallian Region of North America (RELAN) in Chicago, and even prior to enrolling at Manhattan College. It was Accepted Students Day at his alma mater, and the campus tour group Avvento was with had paused to observe a class in session. He felt so comfortable in the environment that he raised his hand to contribute to a book discussion the professor and students were having, despite the fact that he wasn’t familiar with the text. The feeling that he was already a part of the campus community was intoxicating. “There was this spirit [at Manhattan College] that everyone is welcome. The College identifies with the Lasallian spirit in that each student is a gift from God, and that all are called to care for one another,” he says. Years later, Avvento learned that the warmth he felt at Manhattan College was part of something larger – a history of faith in education that is rooted in the teachings of Saint John Baptist de La Salle, and thus, the foundation of the Brothers of the Christian Schools. Their mission, which is to maintain faith and presence in God, respect for all people, concern for the poor and social justice, and instills an inclusive community of faith, is evident in every program they lead. At Manhattan College, Avvento’s professional ambitions mirrored these values. A secondary education major concentrating in social studies, he had multiple encounters that directed him toward a profession that combined education, faith and leadership. One of those encounters occurred during his sophomore year. During a conversation with the late education professor Brother Ray Meagher, FSC, about his future plans, Avvento mentioned wanting to become a salesman, like his father. But Br. Ray returned this statement with a question. “If you’re going to sell anything, why not sell kids on becoming lifelong learners?” asked the former education professor. While at Manhattan, Avvento was a member of the Lasallian Collegians, participated in an outreach trip to West Virginia, and represented the District of Eastern North America (DENA) at the International Young Lasallian Symposium. His senior year, he served as student body president and received the Joseph J. Gunn '30 Alumni Medal, the highest undergraduate honor at Manhattan College. Avvento’s commitment to service continued after graduation, when he joined the Lasallian Volunteers program, and moved to San Francisco. There, he taught religious education classes to fifth through eighth-grade students at De Marillac Academy, and later served as its director of student activities. It was in California that he began spending more time in the Brothers community. “I knew I wanted to work in Catholic education. I also knew that I liked the Brothers, yet I never put those things together and paused to consider becoming one myself,” Avvento said. In 2014, he moved back to New York to become executive director of El Camino, an extended day program run by the nonprofit Seton Education Partners that works to strengthen and revitalize Catholic education in the Bronx. Avvento soon became a bit more prepared to answer his ultimate calling. In February of 2016, he moved into the Brothers community at St. Raymond parish, where he entered his discernment in order to gain a clearer direction toward whether or not he should become a Christian Brother. Within two months the decision was made, and by the end of August, he had received the Brothers habit and was on his way to the Brothers Novitiate in Chicago. Avvento will take temporary vows as a Christian Brother on July 28, 2018, which he will renew every year for 5-8 years. At that point, he will apply for permanent vows that will last his entire life. When asked what he is most looking forward to about eventually becoming a Christian Brother, Avvento refers to the bond he plans to build with young people who need him most. “A lot of kids don’t have a consistent person in their life that they can always rely on. I’m looking to provide a constant, loving presence, and become someone that, whatever you need, go to Brother Paul. That’s what I’m committing my life to,” he says.